Stay 3 nights and receive a $30.00 Gas Card, plus 10% discount on reservation. Must be requested at time of making reservation. New reservations only, no other discounts. May is for Mother's Day!!!! Everything is coming to life again in Lancaster Pennsylvania, Springtime is finally here. 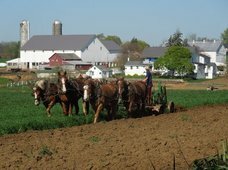 The Amish are working their fields. Farmer's markets and flea markets are in full swing. Downtown Lancaster has many vibriant and exciting galleries and studios. First Friday in downtown Lancaster is May 1 and the weather this weekend should be near perfect. There are still a few rooms available for this weekend, mention this newsletter when making your reservation for dates between May 1 and May 7 and receive a free After Eight Mug and cookbook, $24 value. Two night stay minimum. Only applies to new reservations and you must mention the special offer when making your reservation. There are so many selections of theaters in Lancaster County, religous, comedy, drama, musicals, vocalists and more. Joseph returns May 22 and will be at the theater until October 17, 2015. 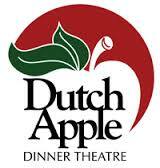 Don't forget our two Dinner Theaters, Dutch Apple and Rainbow. American Music Theater their original production INSPIRE and a line up of musicians on select weekends. 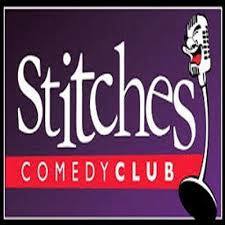 You won't want to miss Stitches our local Comedy Club. Click on the links below for the most up to date information. 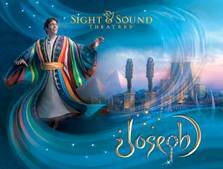 The Sight & Sound Theater is perfoming the "Joseph" May 22 through October 17, 2015. 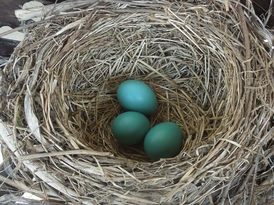 To my surprise a Robin has layed it's eggs right under the barn overhang in a plant stand, which will make it very easy to view the new borns. The weather is warming up and spring flowers are all in bloom, daffodills, tulups, violets and the Chinese Cherry is almost fully open. The dogwoods and crabapples are soon to blossom. The grass is really green and the mowing season has started. It is a great time to visit Lancaster and I hope to see many of you soon.